PB & Jelly Cookie Bars...Yummy! - I Am Proud Of My Kids! 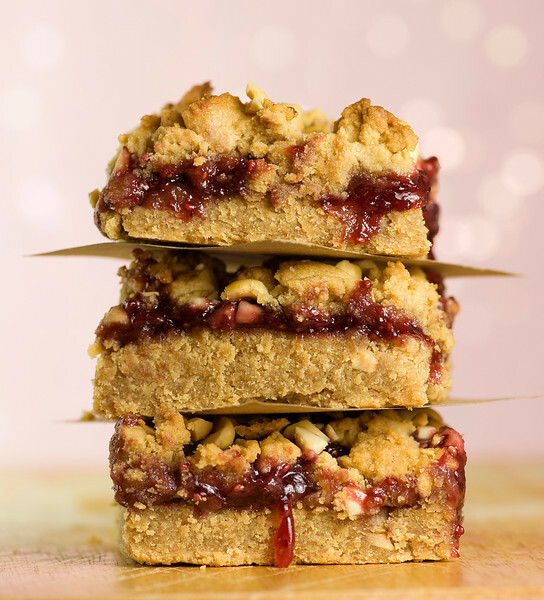 PB & Jelly Cookie Bars…Yummy! Do your kids love PB & Jelly sandwiches? Try this tasty desert recipe that turns a classic sandwich into an easy to make treat. Framedcooks.com, who provided this delicious recipe, prefer Skippy as the top choice for peanut butter and we can’t help but to agree 🙂 Homemade jelly is always good, but for those of us who don’t have the luxury of time, store-brand jelly should do the trick! Check out the ingredients and the cooking directions below! Spray a 9×13 pan with cooking spray, line it with parchment paper, and then spray the parchment with cooking spray and flour it. Cream the butter and sugar in a mixer on medium speed for about 2 minutes. Turn the mixer to low and add the eggs, vanilla and peanut butter and mix until combined. Sift the flour and baking powder together. Turn the mixer back on to low speed and add the flour mixture until just combined. Spread 2/3 of the dough into the baking pan, spreading to the edges (use your hands, it’s easiest that way!) Spread the jam evenly over the dough. Drop small chunks of the remaining dough over the jam. You’ll have some spots where the jam shows through, but don’t worry about that. Scatter the peanuts over the top and bake for 45 minutes or until the dough is golden brown. 2 Comments on "PB & Jelly Cookie Bars…Yummy!" Yummy! I can do this for my son.